A small country along the Western coast of Africa, once torn apart by a brutal civil war, is now just beginning to emerge as a more stable and prosperous nation. 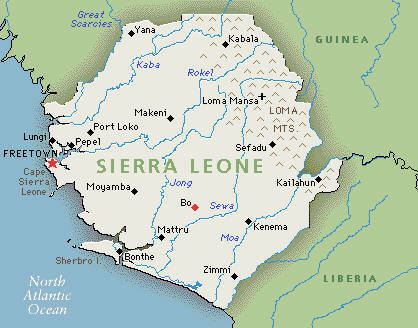 Sierra Leone’s population is largely made up of two ethnic groups known as the Mende and the Temne. The Mende make up around 31% of the total population while the Temne are around 35%. There are a few additional smaller ethnic groups known as the Kono (5%), Kriole (2%), Mandingo (2%), and Loko (2%). In the 17th and 18th century, many of the Temne and Mende were stolen from their country and sold into slavery. Sierra Leone is a predominantly Muslim country (60%) with a smaller Christian minority (10%), along with several indigenous belief systems (30%). Although most of the population is able to speak 2 languages, the vast majority are English speakers. Perhaps the most striking fact about Sierra Leone, most of the population are still in, what Westerners consider, adolescence. Nearly 41.9% of the people living in this country are 14 or younger. It is difficult to imagine until one considers that Sierra Leone is still a country in recovery after its bloody civil war. Finally, the government is considered a constitutional democracy. While still considered mildly corrupt, the stability of this republic is an encouraging sign of good things to come. Sierra Leone is still amongst the poorest countries in the world and is currently fighting deforestation, but a strong abundance of natural resources signals a brighter future for this government and its people. Very interesting things I was unaware of. I never thought about there being a predominantly young population after their civil war. I think education in Sierra Leone at this stage in the countries claimed ‘adolescence’ could really propel them ahead to a much more deserved global ranking – both financially and educationally.